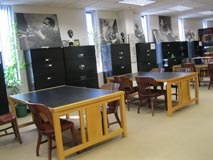 This is a list of repositories -- libraries, archives, historical societies, museums, government agencies, and special collections -- where Newark-related materials have been found and described by the Newark Archives Project. The list grows steadily as the project continues. As indicated, some onsite surveys are currently in progress. For repositories marked "[preliminary]" collections have been surveyed using only information available in their online guides. Use the links to get repository contact information or to see a complete list of collections we have described at each repository.